Sligo swimmer Mona McSharry looks back on her highs and lows of 2018. Mona McSharry has broken several national records of late. ONE OF MONA McSharry’s earliest experiences of being in the water was not a happy one. Aged five, on a family holiday in Austria, she nearly drowned after falling into a swimming pool. Looking back now, McSharry has no memory of that day, but it turned out to be an important moment, as it was then that her parents decided she needed swimming lessons. To say she has mastered the art since then would be an understatement. At 18, McSharry has established herself as one of the top athletes in the country. Last year, she started to garner national headlines with her performances. At the European Junior Swimming championships in July 2017, she claimed gold medals in the 50m breaststroke and the 100m breaststroke. 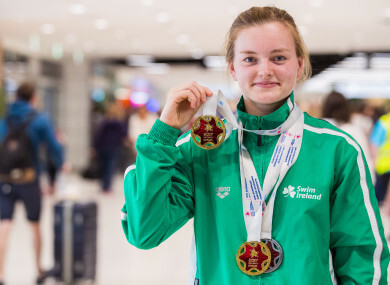 The following month, McSharry secured gold in the 100m breaststroke at the World Junior Swimming Championships in Indianapolis USA, in the process becoming the first Irish person to achieve such a feat at the event, with her time, 1:07.10, eclipsing the 2015 Irish record of one of her idols growing up, Fiona Doyle, by five hundredths of a second. It is consequently an achievement the youngster describes as the highlight of her career so far. She continued to excel at the European Short Course Swimming Championships in Copenhagen in December of last year, coming fifth in her first year competing as a senior, while missing out on a bronze medal by just two tenths of a second. Last month, at the Irish Short-Course Swimming Championships in Antrim, she broke four records (including one twice) in the space of three days. Eclipsing Michelle Smith’s record in the 100m Freestyle, which had stood since 1995, was particularly satisfying. To break it in the morning and then to go even faster in the final was pretty cool,” she says. “And the fact that it was Michelle Smith and it was something that my coach and I had looked it, but we didn’t really think it was achievable this year — we felt maybe next year [it might happen]. And while she has ended the year on a high, McSharry admits that not everything over the past 12 months has gone exactly according to plan. There was a slight sense of frustration at the European Championships, when McSharry’s 12th overall finish meant she missed out on a place in the final of the 50m breaststroke in Glasgow. “Obviously, this isn’t exactly as far as I wanted to come here at the end of the year but all you can do is hope for more next year,” she said afterwards. Last October, she was similarly disappointed with her overall performance at the Youth Olympic Games in Buenos Aires, Argentina. Despite breaking her own previous Irish record in the 50m freestyle with a time of 25.42, there were more lows than highs, with a few below-par performances, particularly in the 50m and 100m breaststroke events. “It is tough, because at the time, I didn’t really know what was going wrong. It’s kind of hard to race through it when you’re going in thinking you’re not going to swim at your best. That was really tough and that was a different type of competition that I hadn’t really experienced before. 2018 was a busy year in which McSharry has been “out of the country as much as in it”. In hindsight, the Sligo native believes “too much” travelling ultimately affected her displays in the pool. “I didn’t perform as well as I would have liked,” she says. The stress of her impending Leaving Certificate examinations at Colaiste Cholmcille in Donegal have complicated matters further. “I missed so much last year, and it doesn’t hit you then until this year, what you’ve actually missed. That’s been difficult, finding free time among everything else, being able to keep up the training and keep your energy up. “I’ve definitely been trying to level [the balance between sport and academics] out, but sometimes it’s about not studying at night, getting the sleep you need and having to deal with the consequences. A normal day for McSharry can start as early as 4am, and encompasses study and training among other responsibilities. Very occasionally getting up at 8, meanwhile, constitutes “a lie-in”. There have been trying times where she has only managed five or six hours sleep, leading her to feel “absolutely zonked” the next day. Next year, though, should be less taxing in some respects — after completing her Leaving Cert, she will take a year out of studying to focus purely on her sport amid a 12-month period that she hopes will finish at the Tokyo Olympics. But despite these looming pressures, she is not complaining, having long been well aware of the sacrifices required to make it as a top-level athlete. The teenage star has spent her life “surrounded by water,” growing up in Grange, County Sligo. Three years after the Austria experience, aged eight, she was going up to Dublin and participating in the Community Games, racing in a big pool for the first time. She was not marked out as an obvious star in the making initially, but gradually, McSharry’s immense potential became apparent. In the intervening period, however, that sense of pure fun when it comes to competing has dissipated to a degree. This year, one of her main focuses has been learning how to enjoy partaking in the sport again. “It got so serious,” she explains. “Not in a bad way, just in terms of how I got very concentrated. I feel like I’ve come back out of myself now and figured out how to enjoy every single race. In an interview with Off the Ball AM last year, McSharry spoke of feeling “overwhelmed” and like she “can’t breathe” at times prior to races. This issue is another aspect of her performance the swimmer has been continually working on. Coach Grace Meade has been a constant source of support, and the pair have been “working on building a really good team of people” to provide further assistance, including highly regarded sports psychologist Caroline Currid, who won an All-Ireland junior football medal with Sligo in 2006. Keeping composed amid the quiet pre-race intensity of the call room is one constant challenge. “It’s very intimidating when you sit in a room of the girls you’re going to be racing against and they’re all getting ready and you’re trying to think what they’re doing. ‘Should I be doing that?’ And trying to concentrate on your own stuff. I’ve definitely gotten a lot better at that, but it’s still nerve-wracking. It’s trying to channel those nerves into something that’s going to help you in the race, turning it into positive energy, and that’s what I’ve really been working on this year. “I would say I’ve come a long way from last year, when I used to be too nervous in the call room. With Tokyo 2020 and Olympic qualification events getting closer, McSharry will continue to train intensively ahead of the nationals at the end of March, which will serve as qualifiers for next summer’s World Championships in Gwangju, South Korea. The gifted 18-year-old has come a long way since that fateful day in Austria, but something that has not changed is the incomparable joy that success brings. Email “‘I’m quite a quiet person’ - The Irish teen sensation who can’t stop breaking records”. Feedback on “‘I’m quite a quiet person’ - The Irish teen sensation who can’t stop breaking records”.